My second attempt at a recipe from the Moosewood Restaurant farm fresh meals card deck was an Andean Quinoa & Corn Salad. Having started the dinner planning with a side dish, I thought fish with some kind of fruit salsa might go well as a main. 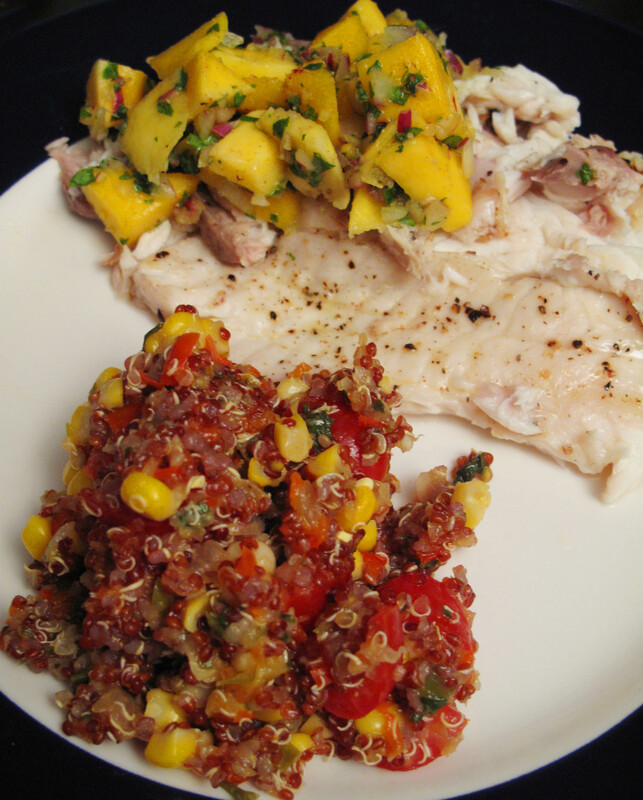 I found this recipe (slightly embarrassed to say) from Oprah’s O magazine online: Grilled tilapia with mango salsa. Although I have made a great veggie lasagna recipe from there, so I shouldn’t dis Oprah so much. For the quinoa salad, rinse 1 cup of dry quinoa under running water several times and set aside to drain. I used red quinoa instead of white since I thought it would look more colorful with the corn. Heat 1 tbs of olive oil in a saucepan, add 1 tsp paprika, and stir constantly for about 1 minute. Add the quinoa, 1 1/4 cups water, and 1 tsp salt, cover, and bring to a boil. Then lower the heat and simmer for 15 to 20 minutes, or until the water is absorbed. Meanwhile, I steamed two ears of fresh corn (you can use frozen corn kernels if you like), cut the kernels off the cobs, and and set them aside in the refrigerator. Heat 2 tbs olive oil and sauté 1 diced onion, 2 cloves of minced garlic, 1 tsp cumin, and 1 tsp coriander until the onions are translucent, about 10 minutes. Stir in 1-2 chopped bell peppers (I used red), a fresh hot chili (seeded, stemmed, and minced), and 2 tbs chopped cilantro, and sauté for another 3-5 minutes. In a large serving bowl, combine the cooked quinoa and the sautéed vegetables and chill. Finally, stir in the corn, 1 large chopped tomato (I used the equivalent amount of chopped cherry tomatoes), parsley (if desired), 1/4 cup fresh lemon juice, salt, and black pepper. This turned out to be a great mix of flavors – perfect for dinner on a hot summer night! If you’re only cooking for two people there will be plenty of leftovers. I tossed the leftover mango salsa in the food processor today, pulsed a few times to make it less chunky, and am bringing it to a barbeque today to eat with some blue corn chips. This entry was posted in Cooking adventures and tagged dinner, fish, sides. Bookmark the permalink.